Ministry of Education retracts permission for school trip to Joseph's Tomb at the eleventh hour - leaving parents and leaders livid. The Ministry of Education has cancelled a school trip to Joseph's Tomb in Shechem (Nablus) at the last moment, frustrated parents revealed Wednesday afternoon - ostensibly for political reasons. No fewer than five hundred yeshiva (Torah academy) high school students were scheduled to make an emotional trip Thursday night - or Yom Kippur Eve - to the Biblical leader's gravesite for prayers and special selichot holiday supplications. The trip, educators said, was fully coordinated with the IDF and the Ministry. The Ministry of Education has cancelled the trip less than 24 hours before the boys were supposed to have arrived, citing security and political issues. A spokesman told Arutz Sheva Wednesday that the reason for the cancellation is simple: the Ministry does not allow trips to Area A - the area of Judea and Samaria primarily under Palestinian Authority (PA) control - "and thus, we would not allow schoolchildren there." Joseph's Tomb, named after the Biblical Jewish patriarch Joseph who is buried there, has been targeted by Palestinian Arabs in the past and is a frequent flashpoint of violence. While the PA is technically in charge of securing the safety of Jewish visitors to the site - who are often restricted to specific hours and days - they are uninterested in enforcing security measures there in practice. The apathy has led to more than one terror attack at the site, ranging from full-scale vandalism and rioting to firebombing incidents. Despite this, the last-minute turnaround has left parents livid. "I made Aliyah [immigrated -ed.] from France nine years ago in order to be Jewish without feeling embarrassed, without apologies," Dr. Phillipe Tiutu, a parent of a ninth-grader from the Netiv Meir high school in Jerusalem, told Arutz Sheva Wednesday. The decision has also drawn ire from local leaders. 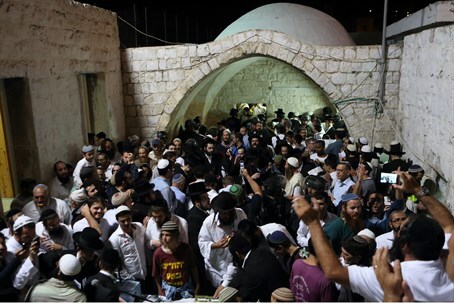 "We see the political intervention of Jews praying at Joseph's Tomb with great severity," Shomron Regional Council Head Gershon Mesika stated. "Preventing Jews from praying at a holy place on the eve of Yom Kippur is unacceptable." "Joseph's Tomb symbolizes more than the connection between the Land of Israel and Israelis; this is a place of tremendous heritage and importance to the Jewish people." Mesika added. "It cannot be that the State of Israel prevents Jews from practicing their religion, and certainly not on Yom Kippur eve." The Chairman of the Samaria Residents' Council, Benny Katzover, agreed. "This is a shameful decision from Education Minister Shai Piron, who is preventing Israeli students from knowing their legacy," Katzover fired. "Despite the fact that the IDF is fully responsible for security of visitors to the site, those who wish to appease the Minister - to whom their Jewish roots are an anathema - actually serve the political interests of the Israeli Left." Students and parents are so frustrated that they have planned a protest at the lookout point near the Samaria town of Har Bracha for Thursday afternoon over the decision. Some 1,000 people are expected to attend.